At first sight Survey Voices looks like a legit paid survey site, where you can join for free to earn some extra cash. 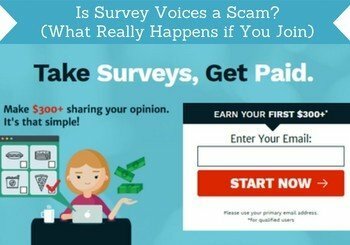 But is Survey Voices a scam or is it really a legit way to make money online? I have tested Survey Voices thoroughly myself, and was surprised what it turned out to really be about. In this Survey Voices review I will show you all the details and a warning you need to know before joining. Then, if you decide to join, you will at least know what to expect. What is Survey Voices and what does the site offer? 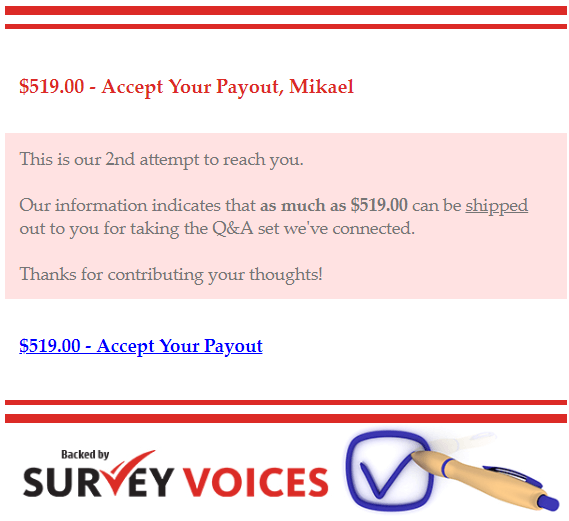 Survey Voices is a website many people interested in paid surveys have heard about, as it has been around for a while. However, I do honestly not understand it has been able to exist for very long after finding out what the site really offers. But I will tell you more about this throughout this review, and then you can judge for yourself. Survey Voices is not as such a survey panel itself. It is instead a survey aggregator, which means it is trying to match you with the right survey sites – or that is at least what it claims. This is very similar to sites like PanelPlace and SurveyCompare, which are both sites that are also just putting you in contact with survey sites. However, even though I am not a big fan of any of the aggregators I just mentioned, Survey Voices takes the low quality to a new level in my opinion. But before getting more into this, let’s first take a look at what you can get out of joining Survey Voices. What Survey Voices is offering is as already mentioned not really any paid surveys on its own. It just gives you access to a list of paid survey sites you can join. Examples of survey sites Survey Voices are promoting. One thing that is great is that the survey sites that are listed are actually more or less all legit survey sites, where you can actually get paid. As you can see on the image above, one of the survey sites listed there is for example Swagbucks, which is one of the best and most popular survey sites. However, the list is very short. I only got a list of 6 survey sites. And you will get no valuable information about any of these sites to help you decide which ones are the best to join for you. And there is absolutely no need to join Survey Voices just to get this small list of survey sites. Especially because the joining process is not as easy as on other survey sites, and the terms you have to agree to are VERY poor and can give a lot of hassle, as I will explain later. Even though the main thing Survey Voices offers is a list of paid survey sites, there is one more thing you can get there. In the sign up process, you get an option to see more “exclusive” offers. While signing up for Survey Voices, you will be offered several “exclusive” offers. This is not really exclusive offers, but mostly just some offers from some of Survey Voices’ partners, so it is more just ads you can see and click. I my opinion the offers on Survey Voices are not worth taking, as they are once again not about promoting quality, but just about trying to advertise something to you, but without any real value for you. I have also made short video review of Survey Voices you can check out. Below the video you find find further details. 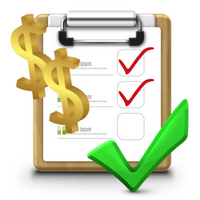 There are many different ways to get paid on survey sites, and the payout options are important to consider, before joining any survey panel. I personally prefer survey panels that pay via PayPal, but there are also many other great rewards survey sites use. However, there are no payout methods on Survey Voices. It is only connecting you to survey sites, and the survey sites themselves are the ones paying you, so you still have to go to each of the survey sites and sign up there again. So you do not get paid on Survey Voices. And when considering what really happens after you join Survey Voices, it is a site I do not see any reason to join at all. What really happens when you join Survey Voices (Warning)? As you know already, you will only get access to a small and superficial list of survey sites after joining Survey Voices. You will however get something else as well – you will get A LOT of spam. This is very unusual and the legit survey sites never sell your info to others, and you will not start receiving more spam after signing up. But on Survey Voices a part of the conditions you agree to when joining, opens you up to spam. Make sure to read the terms and conditions written in small print, before joining Survey Voices. To sign up you do not only have to give your email but also your phone number. Most survey sites do not ask for your phone number in the sign up process, but Survey Voices do. As you can see on the image above, you have to agree to the terms to sign up, and these terms are that you can start receiving calls and messages from Survey Voices’s marketing partners. This reveals the true intent of Survey Voices in my opinion. It is not to connect you to the best survey opportunities, but to get your information and sell this to their marketing partners. Seeing how poor info that is available after joining, further confirms this. I most admit that when I saw these terms, I provided a false phone number, as I had an idea about what would happen, if I agreed to this, as I have tried something similar before, and started receiving a lot of phone calls from people that wanted to sell me stuff. I did however provide my real email address, and this made me regret I ever signed up for Survey Voices. I immediately started receiving a lot of spammy offers on my email – not only from Survey Voices, but also from what I assume are their partners you have to agree to be contacted by. I started receiving A LOT of spam emails after signing up for Survey Voices. The above image shows an example of an email I received form Survey Voices Research. The funny thing is that I had not taken any survey there, and I then receive an email saying I have $519 waiting for me. This was not the only kind of this email I received. I received many daily and all of them with these claims that I had won and had a certain amount of money available that were just waiting for me, if I clicked the link in the email. It is of course not unusual to receive spam mails with crazy claims like this to get you to click links, but what is unusual is the huge increase in these email I got just after signing up for Survey Voices. Survey Voices’ FAQ section says that anyone can join. However, when filling out the sign up form, you can only select an address from the US. But no matter where you live, you should not be upset, if you cannot join Survey Voices. It is a terrible site to join in my opinion, and you should instead look into joining the legit survey sites in your country that do not spam you, and where you can actually earn money by taking surveys. Can you at least then contact Survey Voices’ support and ask them to stop the spam, after you join or ask any questions? No, you cannot. There is no contact info for Survey Voices on the website. Also, not after you join. There is just a list of contact info for the different survey sites themselves, and you are told you have to contact them directly. Regarding stopping the phone calls and emails there is not one place where you can stop all of these. Survey Voices FAQ clearly says you have to do this at the individual partners. So it will probably be a while, before you will be able to get the phone calls stopped. For me it took several weeks, where I every day unsubscribed from several the spam emails I received from Survey Voices’ partners to get my inbox back to normal. I think it is clear by now that I do not like what Survey Voices is offering. But let’s sum up the pros and cons to get a better overview. I do not know, if I as such would call Survey Voices a scam – they do not as such do anything illegally as far as I know (I am not a lawyer). When signing up you are yourself agreeing to receiving phone calls and emails from their partners. But no matter what, it is in my opinion a site to stay away from. You get no value out of joining, but you will however start receiving a lot of promotional calls and emails. If you do not mind this, you can still sign up for Survey Voices without any financial risk, as it does not cost anything to join. In my opinion it is however a complete waste of time. I have tested many survey sites and also survey aggregators, and this is one of the worst. If you want to make money by taking surveys, there are however many great survey sites that are definitely worth joining. You can click the link below to see the best of these sites. If you have any comments, questions, or have any experiences with Survey Voices yourself, feel free to leave a comment below. Survey Voices is in my opinion a complete waste of time. It does not only give very low quality information, you also have to agree to receive promotional phone calls and emails to be able to join. I really loathe survey sites because any effort that one puts in, even on the legit ones, is met with so little return. Like maybe $1 for an hour or something crazy. No thanks. Has that been your experience? I feel like I would rather be flipping GMO hamburgers at MCDs than sell all my info on a soulless survey site for a buck or two an hour. Sorry you in general feel this way about survey sites. I very much disagree that it is such a waste of time, if you join the legit sites. I agree that Survey Voices is a waste of time, but there are luckily many survey sites that are worth it. Many of them also pay decent. You will not get rich from taking surveys or make a full-time income, but you can make some nice extra money on the side. Furthermore, survey sites is one of the only ways you can start making money online, where you will make a profit from day one, and where there is no risk involved at all, if you stay away from the scams. It is also a great way to have your opinion heard about important topics and be involved in the future development of products and services. So I definitely think survey sites can be worth it in general (but Survey Voices is not) – it is a matter of the approach and expectations. If you are looking for a way to make a full-time income online, it is not a good solution, but if you would like some extra cash on the side, while sharing your opinion and with no risk involved, then it is the best option you can find online in my opinion. I think this is an excellent report on survey voices. You see I have survey sites trying to urge me to take surveys every day, and I have taken a group of these. However, I have never ever completed one of these that has paid any money whatsoever. Usually when I get towards what is supposed to be the end, I am offered what I would call a consolation prize that they want me to pay shipping and handling for, and then I am directed to a continuation of what seems to be the same survey all over again. I think it’s great that you also include some legit sites which will pay real money for your participation, because as I’ve said I haven’t seen one yet. Sorry to hear about your experience with paid surveys so far. There are definitely legit sites that pays in cash without any problems – and then there are unfortunately sites like Survey Voices and others that give paid surveys a bad reputation. But if you find the legit sites, it is a great way to make some extra money on the side while at the same time have your opinion heard. Thanks for this informative review about survey voices. I’m glad on one part that it offers legitimate survey sites — but I don’t like how they will spam your email box with promotional ads. I would rather do my own research and join laid survey without having someone else tel me if they are good or not. In my experiences it is a HUGE amount of spam you will get after signing up for Survey Voices – have not tried anything like it with all the survey sites I have used and tested. And when it at the same time do not really provide any valuable information, then it is in my opinion just a big waste of time – definitely makes since you prefer doing your own research instead of joining Survey Voices for advice. As there are many paid survey sites so there are also many scam survey sites. I am always confused on the paid survey site I would join for fear of these scammers. Now you have done a great review on this Survey voices, it is an eye opener on their practices. What I don’t know is, could it be that these survey sites that give a very long survey to answer within 10 minutes or so could be a sign of scamming? because I could not believe that any one can answer that long questionnaire in that very short time. Your site is great, and it will help people to make a right choice of paid survey site they could join. Thanks for your comment and feedback Matron. Most survey sites do not as such give a time limit on how long you are allowed to spend on a survey. They usually give a time estimate before starting, so you know what to expect. On the scam survey sites there are usually no time estimate as you never even get to take a real survey.